Some amazing high school grads have stopped by the shop to find their dress for prom. Here are some of our house favourites. Looking back at my own prom dress (forever ago) I could have used Mia Bridal Co.!! I love the look of this dress by Amsale. It's simple, effortless and available in some beautiful colours. If you're one to accessorize, this is the style to do that. It looks incredibly rich with big, bold jewelry. (big right now). It has the perfect sweetheart neckline and can be accented at the waist with a big sparkly belt. 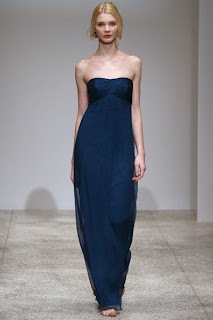 This dress by Lazaro is adorable! I love the full, flirty skirt. Equipped with pockets for your fave lip gloss.